At the age of 14, the art of Arnis was introduced to young Rodel. Every afternoon, he was summoned by his parents and brothers to learn the techniques. At sunset, his arms were full of bruises which made him hate the sticks at first. As a boy, he did not appreciate the training at all. During those times, training was very informal and no system was known nor followed. They called the primary weapon as “baston”, referring to the sticks being used. To understand it fully, he enrolled himself at a gym in Iloilo, his hometown, to study Shotokan Karate. In 1968, he earned a greenbelt rank. In 1970, he moved to Manila where he continued to practice Karate at the National Amateur Karate Organization (NAKO) and earned his 5th Degree of Blackbelt ahead of Arnis. At that time, the Modern Arnis Federation of the Philippines (MAFP) shares the same office with NAKO. There he met Grand Master Remy Amador Presas and an eternal friendship between a genuine Arnis Grandmaster and a loyal disciple was formed. They speak one common dialect even though they hail from two different provinces. The late Arnis Grandmaster convinced Master Rodel to focus on Arnis. He was encouraged to stay at the gym and serve as a utility boy in exchange of learning the craft of Arnis. 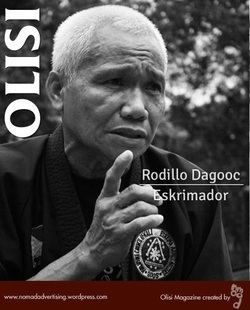 In 1972, Master Rodel earned his blackbelt rank (Lakan) in Arnis. He continued to become one of the Grandmaster’s top students. He was assigned to assist in teaching Modern Arnis to his fellow students. In 1978, he first left the country for Osaka, Japan, where he showcased Arnis, the Philippines’ National martial art and sport. At that time, he had no idea that it is already the start of his great career as an International Modern Arnis Instructor. From then on, he started traveling from one country to another. After several years, Master Rodel’s patience, determination and faith in God paid off. Many invitations were sent to his mailbox. At present, he has already visited several countries such as Australia, Israel, Italy, Brunei, Spain, South America Japan, Mexico, Thailand, Germany, and various states in the US. · In 1997, he received the “Master Instructor of the Year Award” by the World Head of Family Spokeship Council International Hall of Fame in Florida, USA. 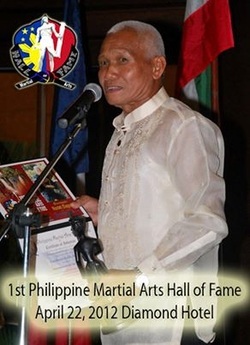 · The late Grandmaster Remy Presas promoted him to “Lakan Walo” (8th Degree Blackbelt) in 1999, perhaps the highest rank given to any of his loyal students. It was observed by the huge crowd of Martial Arts enthusiasts in Rizal Park, Manila. · He is also an awardee in the 18th Parangal ng Bayan Awards for his immeasurable contributions in Sports held in Makati, Philippines in 2003.